A question arises: would American adults be better off using their out-of-pocket medical expense money to buy dietary supplements rather than drugs? Before the dollars-and-cents of this issue is addressed, a major misdirection by American medicine needs to be confronted. The prevailing practice of modern medicine is to consider every malady a drug deficiency. Yet we know so many health problems emanate from overloads or deficiencies of essential nutrients. Examples would be: for a nutrient deficiency — mental depression from a lack of folic acid, and for nutrient excess — high cholesterol, fatty liver and arterial disease from iron overload. So many drugs that are prescribed are inappropriate because the condition they are prescribed for has a nutritional origin. The drug never addresses the true cause of disease, it only masks its symptoms. Furthermore, the biological action of most prescription drugs can be duplicated with dietary supplements, with fewer side effects and lower cost. There is good reason to search for alternatives to prescription drugs beyond just cost. Inappropriate prescribing is a widespread problem in modern medicine, despite the many checkpoints (doctor, nurse, pharmacist) prior to patient use. Oftentimes, “drug therapy can do more harm than good.” One recent study found 69% of elderly patients were prescribed inappropriate medications. This study did not include factoring for underlying nutritional deficiencies caused by drugs themselves. The number of medications used by older adults is associated with poorer nutritional status and declining physical health. In a recently published study, as the number of daily medications had a statistically significant negative effect on nutrient intake and nutritional status. Obviously, patients focus on taking drugs rather than eating the right foods, which would simply make drugs masking agents for underlying nutritional deficiencies. For retirees on fixed incomes, the consumption of herbs, spices and oils is just one example of how out-of-pocket medicine expenses can be demonstrably reduced. So at least some of the out-of-pocket costs of medicines could be eliminated entirely by physician instruction. A good example of the high cost of ignoring dietary supplements can be seen in the treatment of mental depression. An estimated $12 billion of antidepressant drugs are sold annually in the U.S. But we know that 15-38% of adults diagnosed with depressive disorders have low or deficient blood serum levels of folate (folic acid, vitamin B9). Antidepressant drugs don’t even work very well when folate levels are low. 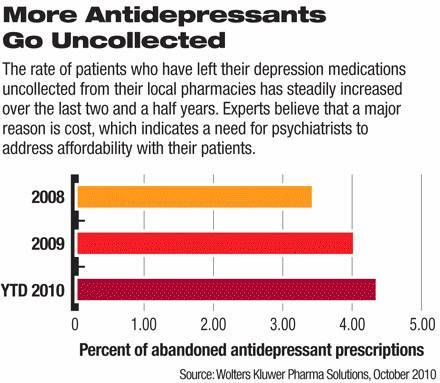 Many times patients don’t even pick up their filled prescription for antidepressants at pharmacies due to their high cost. Side effects are another reason for non-compliance with drug regimens. We also know that one-fourth of the US adult population will have a depressive episode in their lifetime. We know the antidepressant action of folate cannot be explained away by the placebo effect since animals respond to folate supplementation in laboratory models of depression. The percentage of non-elderly adults who use antidepressants is on the increase. Antidepressant drug use increased from 6% to 10% between 1996 and 2005. Doctors are not required to conduct blood tests for folate deficiency before they prescribe mood-elevating drugs. A guesstimate is that $1.8-4.6 billion of anti-depressant drug use is inappropriate and might be resolved with an inexpensive B vitamin cocktail instead of a costly and problematic mood-altering drug. One survey showed that branded antidepressant pills cost $37-42 per month ($1.23-1.40 per day), while generics cost $8-17 per month (26-56-cents per day). These prices appear to be affordable. But for comparison, a high quality folate/folic acid pill (Solgar) sold at an online site (iherb.com) is priced at just $12.40 for 100 tablets, or 12.4-cents a day. We’re talking hundreds of dollars of out-of-pocket savings here, aside from the B vitamin being more suitable for this condition. While part of the bill for an anti-depressant drug would be covered by a health insurance plan, it is likely that the out-of-pocket costs for an anti-depressant drug would be far higher than the folate pill. But probably most patients feel the insurance-covered drug is more affordable than an uncovered dietary supplement. Vitamin pills are not covered by Medicare unless in a prescriptive dose. Assume the deductible or co-payment for an antidepressant drug is $7 per month, for a total of $84 a year, while a year’s worth of folate/folic acid pills would cost only $45.26, a savings of $39 (47%) in annual out-of-pocket costs. Another survey shows that pain relieving (analgesic) prescription drugs typically cost an adult patient without insurance coverage from $12.86 to $61.60 per prescription (43-cents to $2.50 per day), depending upon the medication. Many adults today cannot afford to purchase health insurance to help cover the cost of pain medications. Lower cost alternatives are not offered by physicians and most patients are unaware of any natural molecule that is an effective pain reliever. For comparison, tart cherry extract, available as a dietary supplement, has been shown to provide anti-inflammatory pain relief equal to that of ibuprofen. A 1000 mg tart cherry pill (Solgar/ iherb.com) is priced at $22.38 for 90 pills, and taking 1 capsule per day, this would only amount to 25-cents per day, less than most prescription pain relievers. In this example, out-of-pocket savings may appear to be small using dietary supplements, but they are very significant to people with limited incomes. It may be difficult for physicians to comprehend the financial predicament that many Americans are in. An authoritative survey of out-of-pocket medications costs among adults aged 51 and over on Medicaid was recently published. The survey revealed that financially poor households without Medicaid allocated ~72% of their total resources to basic living needs ($17,421), while Medicaid patients had scarcer resources ($12,498) and allocated ~85% to basic living needs. After paying for basic living needs and healthcare costs, these families had, on average, $16 left each week. Medication costs consumed the largest proportion of health care expenses for both Medicaid ($463) and non-Medicaid ($970) households. Despite the fact there is no safe prescription anti-inflammatory drug, the option to use safer and more economical dietary supplements is ignored. Yet here again, patients probably opt for the higher out-of-pocket cost drug than the dietary supplement, unaware of tart cherry’s pain relieving properties. A survey of osteoarthritis (bone-on-bone, wear-and-tear arthritis) patients reveals their annual out-of-pocket costs for health care expenditures ranges from $1379 for females/$694 for males (2007 dollars) and insurer expenditures of $4833 for females/$4036 for males, which includes office visits and tests. Given that about half of those costs were for medication, pain relieving drugs would range from $29 to $58 per month. Certainly many natural anti-inflammatory agents like tart cherry would cost less out-of-pocket. Beta blockers, diuretics and cholesterol-lowering drugs are the three most commonly prescribed drugs for Medicare patients. Surprisingly, there is not a strong scientific basis for using any of these three drugs. Dietary supplements as alternatives to these drugs should be front-line therapy. The most commonly prescribed beta blocker is associated with a 26% higher risk of stroke compared with other drugs. This represents disease substitution rather than disease eradication. Despite their widespread use, experts now say beta blockers should not be front-line therapy for high blood pressure. Beta blockers slow the heart rate and thus help to reduce blood pressure, but a fast-beating heart is not the cause of hypertension and fish oil does this equally well without side effect and at less cost. It has become clear that diuretics are prescribed in the face of salt over-consumption, and that reduction of sodium in the diet would be a more appropriate approach to blood pressure control. One common class of water pills raises cholesterol levels which often causes doctors to prescribe yet another medication. Diuretic side effects are a major cause of re-admission to a hospital. And many hypertensive patients are placed on three blood pressure drugs because no single drug works effectively. Patients who are prescribed beta blockers and diuretics are at greater risk to develop adult-onset diabetes. Strikingly it was recently reported that the addition of garlic rather than a second drug would be more beneficial. Cholesterol-lowering drugs have never been demonstrated to reduce mortality rates for coronary artery disease and statin drugs are actually liver toxins. The Therapeutics Letter reports that among healthy adults only 1 of 71 patients taking statin drugs will avert a non-mortal heart attack over a 5-year period. A review of ten major studies shows there is no evidence that statin drugs reduce mortality rates for coronary artery disease. 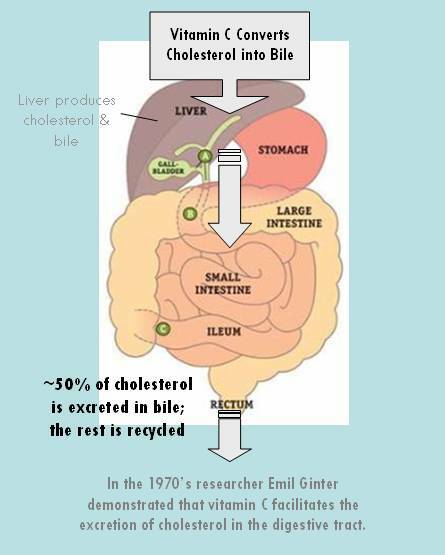 One study shows 11% of patients taking cholesterol-lowering drugs experience elevated liver enzymes, a problem which would surely cause the FDA to ban any herbal remedy exhibiting the same problem. With this said about the failings of statin drugs, it has been reported that the health benefits of statin drugs and vitamin D appear to overlap. Are statin drugs just high-priced patentable versions of a common vitamin? Low circulating levels of vitamin D and its active storage form (25-D) are associated with low HDL “good” cholesterol and high levels of LDL “bad” cholesterol. Statin drugs are known for causing muscle aches. It appears that statin drugs actually deplete vitamin D which then results in this toxicity. Supplemental vitamin D appears to be a natural antidote to this problem. Another secret that modern medicine hides from view is the role of vitamin C as a “statin.” Statin drugs work by inhibiting an enzyme that produces cholesterol in the liver. However vitamin C works in a more efficient and less toxic way to remove blood fats via cholesterol’s conversion into bile which is ten excreted in the digestive tract. In the 1970s Emil Ginter, a pioneer researcher in Bratislava, Slovakia, conclusively demonstrated that the provision of vitamin C to animals such as guinea pigs that do not naturally produce this vitamin in their liver as most other animals do, will spare these animals from inevitable arterial disease. Humans are in the same predicament as guinea pigs. Due to a gene mutation, Homo sapiens lost the ability to synthesize vitamin C many generations ago. The provision of supplemental vitamin C, at doses (500 mg) that far exceed what is currently recommended by the Food & Nutrition Board (60-90 mg) has been shown to reduce total and LDL cholesterol levels in humans. Other studies by Ginter showed 500 milligrams of vitamin C taken twice a day optimally reduced circulating cholesterol levels in humans. This suggests an outright shunning of scientifically proven therapies that are far less expensive and problematic than current statin drug therapy. That modern medicine has chosen far more expensive and problematic patented drug molecules over less expensive natural molecules suggests intentional gouging of money from many Americans who live on fixed incomes. Brand name statin drugs often cost $3-to-$4 per day. Only when a statin drug cost less than $1 a day are they deemed to be cost effective (reduce the need for further medical care). 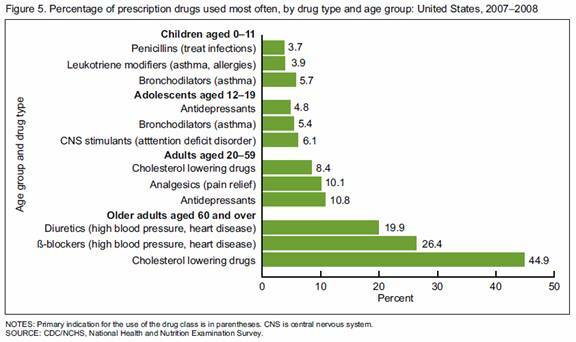 Yet doctors cavalierly prescribe these high-price pills every day with little or no regard for cost effectiveness. For comparison, vitamin D (5000 IU – calculations previously shown) @4.0-cents per day and 500 mg of vitamin C twice a day (Natrol buffered C 225 tablets $10.83 iherb.com) cost 7.6-cents per day, or 11.6¢ cents per day for both vitamins. A year’s provision of vitamin C + D would cost around $42.34 compared to whatever co-payments and deductibles Medicare patients must pay for a cholesterol-lowering drug. 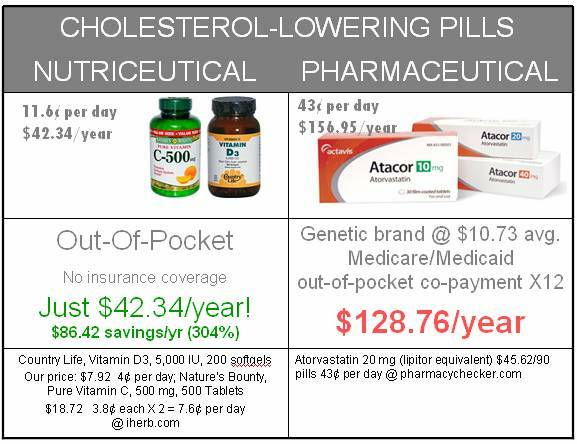 Using the average co-payment for a prescription drug under Medicare/Medicaid of $10.73, or for branded drugs $22.73, this amounts to out-of-pocket costs for statin cholesterol-lowering drugs of $129-to-$272 compared to $42.34 for the vitamins. Vitamin D is another natural medicine that appears to have promise for control of blood pressure. Low circulating levels of vitamin D are associated with hypertension. Modern medicine points to failed studies when vitamin D is used prescriptively. However, one failed trial used the less-effective synthetic vitamin D2 and only 123 IU was given per day (100,000 IU in a single injection for a 16-week period). Another trial used the natural vitamin D3, but again employed an ineffective dose (10,000 units vitamin D3 in a single injection for a 5 week period (285 IU per day). The current practice is for physicians to prescribe single molecules as synthetically made drugs for each and every diagnosed condition, sometimes two or three drugs for the same condition, which results in polypharmacy – overmedication, and terribly burdensome out-of-pocket costs for patients. Drug interactions and drug side effects then often lead to yet more drugs to treat side reactions. The more drugs elderly patients take, the more likely they are to incur a hip fracture, which often leads to mortal outcomes from immobility and subsequent pneumonia and death. Elderly patients taking 10 or more medications are 23 times more likely to sustain a hip fracture. Modern medicine spends more time belittling dietary supplements while never undergoing self examination. The insanity of the pharmacological approach to health is clear in the medical literature, but in practice physicians exhibit a smug attitude that drugs are more science based. In fact, a vast body of literature suggests pharmaceuticals have already been disproven, while nutriceuticals are unproven due to lack of proper study. The era of genetics opens a new way of examining the safety and effectiveness of medications. Analyzing dynamic epigenetic changes in genes rather than static inborn gene mutations, researchers at the University of Pittsburgh Medical Center now propose that epigenetic side-effects of pharmaceuticals may be involved in the etiology of many diseases including heart disease, cancer, neurological and cognitive disorders, obesity, diabetes, infertility, and sexual dysfunction. These researchers further note that epigenetic side-effects caused by a drug may persist long after the drug is discontinued. These striking revelations suggest a major re-direction by modern medicine. One of the revelations coming out of personalized medicine, where the inherited makeup of a person’s genes is matched against certain drugs, is that it has become apparent that many drugs cannot possibly be effective for all patients. Genetic screening is resulting in fewer rather than more drugs being prescribed. Some insurance plans will not pay for expensive cancer drugs without prior genetic screening. Furthermore, there is the realization that there is treatment resistance to antibiotics, cancer drugs and other pharmaceuticals that may not be experienced by nutriceuticals. Another way of examining out-of-pocket costs for medicines is longitudinally, that is, the accumulated cost of drugs over the duration of a person’s retirement years. Out-of-pocket expenditures for drugs vary widely over the retirement years. Figures for drug costs alone aren’t available separately but rather are lumped in with costs for insurance premiums and co-payments. A man who retired at age 65 in 2010 and is at the mid-point (median) of drug use will need $65,000 in savings to cover for out-of-pocket drug expenses, while a man who needs more medications (90-percentile) will need to save $100,000. If he lives 20 years to age 85, then he would spend approximately $3250 to $5000 yearly for drugs over and above what Medicare and Medigap plans pay for. Using nutriceuticals would be far more economical. While a recent report says it is important for Medicare patients to “pick the right drug” which could “save you a bundle,” there is no mention that dietary supplements are more affordable alternatives to drugs. In fact, advising seniors to save for future out-of-pocket medical expenses is ridiculous if they have not already done so. So it becomes even more important to save on drug expenses in some immediate way by searching for more affordable alternatives like dietary supplements. One of the revelations coming out of genomic medicine is that small natural molecules can alter a broad number of genes involved in aging and disease. Single-gene targeted drugs have been a disappointment. Furthermore, genes are linked by networks, suggesting one nutriceutical could remedy many diseases, rather than just one. This is the future of cost-effective medicine, to take advantage of how natural molecules work, which is very broadly. However, such a future would financially topple the major pharmaceutical companies. Science is headed in one direction while offering to the public are geared for profitability, not cure. Three small molecules exemplary of broad action upon the human genome (library of genes) are resveratrol, known as a red wine molecule, vitamin D, actually a solar radiation-produced hormone that can be captured in a pill, and a sulfur-based molecule N-acetyl cysteine (NAC), all available as dietary supplements. Resveratrol exhibits such broad action over the library of human genes that its biological action has been called promiscuous. Resveratrol exhibits anti-inflammatory, antibacterial, antiviral, antifungal, anti-clotting, antidepressant, anti-cholesterol, and anti-diabetic action even at low doses. Resveratrol has been demonstrated to turn mortal heart attacks into non-mortal events in the animal lab. Resveratrol blocks cancer at all three stages of development (initiation, growth and spread). Resveratrol has been demonstrated to work in humans at a very low dose. Resveratrol could potentially replace many medicines in modern pharmacology. A year’s supply of resveratrol (40 mg dose) would cost about 18-cents a day or ~$68 a year. Vitamin D, the sunshine vitamin, has application for diabetes, osteoporosis, mental depression, infections, autoimmune disease, organ transplant rejection, heart disease and heart failure, cancer, and many other diseases. Supplemental vitamin D is now on the drawing board as therapy for multiple sclerosis, lymphoma, osteoarthritis, stroke and hypertension. A strategic report suggests Northern Europe would reduce the burden of health care costs by hundreds of billions of dollars by provision of adequate amounts of supplemental vitamin D. Extrapolated to North America, it is estimated that the provision and consumption of vitamin D in the US would save $4.4 trillion in health care costs over a decade. Vitamin D is low cost medicine. A vitamin D supplement providing 180 easy to swallow softfgels, 5000 IU dose (Doctor’s Best), sells for just $7.98 (iherb.com), or just 4.5-cents per day, about $16.00 a year. NAC has broad application in psychiatry, for compulsive behavior, bipolar disorder, schizophrenia and overcoming substance abuse. NAC is now recognized as an antidote to noise-induced hearing loss. NAC has even been shown to protect fragile cells at the back of the eyes that can be damaged by cigarette smoke. NAC inhibits the replication of flu viruses. Multiple applications of NAC have been contemplated for some time now. NAC tablets would cost ~12-cents a day or about $44.00 a year. Modern medicine has cooked up its own version of preventive medicine with a polypill. The idea of a polypill – many drug molecules in one pill – has been proposed for some time now. There are various versions of the polypill. It was originally proposed to contain low dose aspirin, folic acid, a statin cholesterol-lowering drug, and three blood pressure medications at a proposed cost of $2-3 dollars per day. It is said that a polypill would prevent over 80% of heart attacks and would be taken by healthy adults as they reached middle age. Studies show a polypill would be cost effective if it were priced under $443 per year. 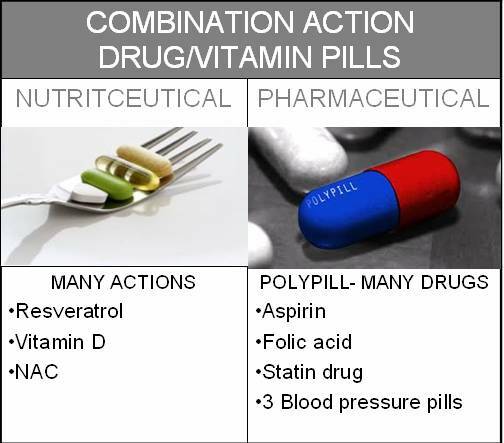 While the originators of the polypill (5 drugs + 1 vitamin) concept have launched a rather admirable and bold attempt to prevent rather than just detect and treat cardiovascular disease, according to the Drug- Induced Nutrient Depletion Handbook, 2nd edition (2001, Lexi-Comp), some of the ingredients in the polypill could induce shortages of nutrients essential for cardiovascular health. Examples are statin drugs which deplete coenzyme Q10 and vitamin D, diuretics which deplete electrolyte minerals (magnesium and potassium), aspirin which depletes folic acid and vitamin, potassium and vitamin C, and beta blockers which depletes coenzyme Q10 and lisinopril ACE inhibitor which depletes zinc. Aspirin is the chief low-cost standby medication for conventional medicine. While aspirin has been shown to thin the blood and prevent blood clots from forming in the four major coronary arteries, thus averting a heart attack, the effective dose of aspirin to avert a heart attack is greater than a baby aspirin (81 mg) that many Americans take. Hearing this, patients may elect to double-up on their daily baby aspirin. However, the effective dose (160 mg) increases the risk for bleeding gastric ulcers and brain hemorrhages and represents disease substitution rather than prevention. Even a baby aspirin more than doubles the risk for a mortal bleeding ulcer. Meanwhile, one nutriceutical under development has already been demonstrated that would be a better alternative to aspirin. It has been demonstrated to turn mortal heart attacks into non-mortal events in animals (human studies would be unethical), activates genes that inhibit the growth of new blood vessels involved in obesity, cancer, retinal, kidney and nerve disorders, and thins the blood like aspirin, and favorably controls cholesterol, and widens (dilates) blood vessels to control blood pressure. Out-of-pocket costs for prescription medications can be very burdensome, particularly for retirees on limited incomes who have only a few dollars of discretionary spending money left over after paying for basic needs and drugs. The current system of therapy and prevention promotes expensive medications over equivalent dietary or supplement measures which are far less costly. Patients mistakenly assume drugs covered by insurance plans are cheaper and more effective than dietary supplements, whose cost is not covered by insurance. Doctors cast a blind eye to the drawbacks of modern pharmacology and the narrow biological action of drugs. Synthetic molecules in prescription drugs induce side effects and create need for even more drug to treat side effects, further increasing out-of-pocket costs. 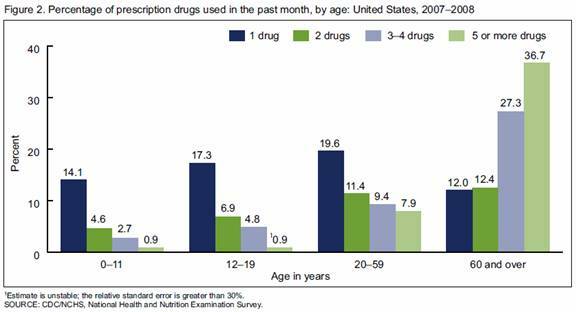 Many drugs are inappropriately prescribed to treat symptoms caused by a nutritional shortage or overage. The patient will never get well. Patients mistakenly believe nutriceuticals may interfere with drugs rather than drugs deplete nutrients. Modern medicine is entering a new era where small natural molecules are being discovered that exhibit broad biological action, which points to a day when one drug may treat or prevent many diseases rather than the current paradigm where many drugs are needed to treat one disease. 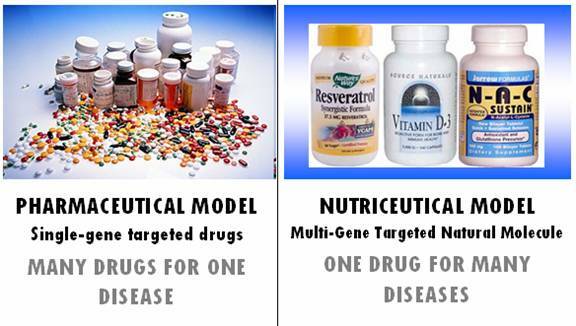 However, it is unlikely that modern medicine will embrace and prescribe such broad acting, low-cost nutriceuticals. The public is left to fend for themselves in unguided self care. Dietary supplements can significantly reduce out-of-pocket costs for medications as evidenced by the examples provided in this report. © 2011 Bill Sardi, Knowledge of Health, Inc. April 2011 Not for posting on other websites or for commercial distribution. Thank you four nice writing. It will help me for my research on prescription medications. It is so nice to see the Knowledge of Health up and running again. I missed it. Also, thank you for all the helpful information you have given to me over the years via private response. I wanted to get you advice on one issue I am facing. It seems for about 2 months I have a low grade burning sensation in my stomach in the area around my belly button. I am concerned because I usually do not have these type of issues. Wisdom tells me to go and have it checked by a doctor. However, in just doing some general research it looks like it could be a symptom to about 45 different things. I guess I want to dismiss anything major like a tumor, leaky gut, or possibly bleeding. Do you have any advice or suggestions on 1) what tests I should try and ask for so that I am not wandering down multiple trails with the Doctor 2) anything in a natural solution that might eliminate it in case it is more of a stomach acid problem?. I know this is general information to you but any input would be welcomed. Might be H. pylori infection, the bacterium that causes ulcers and shuts off our acid-producing cells. Cinnamon extract kills it, garlic helps to kill it. Might be when you withdraw from refined sugars, the yeast groan and you feel pain as they die off (good thing). Garlic and oregano kill off the yeast. Leaky gut would be causing food allergies and undigested proteins would be entering your blood circulation. If bleeding, your stool would appear black. That could be from an ulcer. If guessing a tumor, start taking vitamin D3, resveratrol, fish oil, some IP6 rice bran extract, for a time.